I’ve mentioned Apple’s uncle Preecha before. He’s the man who made a very good living in polymers and has used some of his funds to create a car collection for himself; his most recent addition, the Mercedes R171 roadster, was featured on this site back in February. Today, we finally got to see the rest of his local car collection — he swung by in a black Mercedes AMG sedan this afternoon, and after a brief stop at a coffee house for drinks and cakes, we headed for the main event. Preecha owns a warehouse here in town which looks like it could be outfitted as a full-fledged mechanic’s shop. It has a large shop floor with bay doors, a glass-enclosed floor office and an upper level with still more rooms. For his purposes, it’s a glorified garage that holds all seven of his locally-stored sports cars. 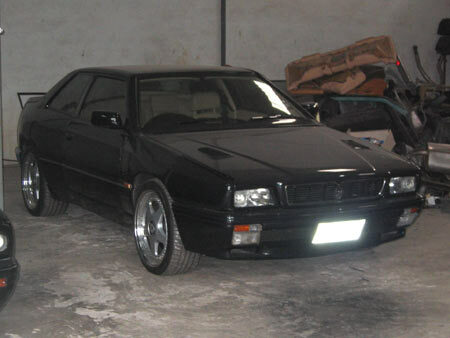 The definite pinnacles of the collection are the four Maseratis, each a rare model from the 1990s, the likes of which I’ve never seen before, and all of which are original, authentic biturbo machines. He also owns an Audi S6 which he’s had specially modified by SMS, adding about 60 horsepower; his new Mercedes R171 roadster with its sweet red interior, and the aforementioned AMG E-class with a supercharged V6. Five of the seven cars are black. More pictures of the cars after the jump. The Maseratis were the main attraction. The oldest is a white Maserati 222 SR, a model year 1993 if I remember correctly. 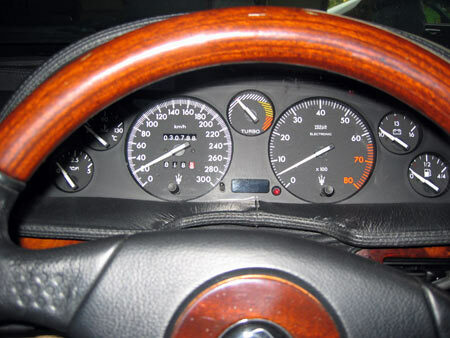 As with the others, its interior is all hand-stitched leather and authentic wood trim, with no dull plastic to be found. 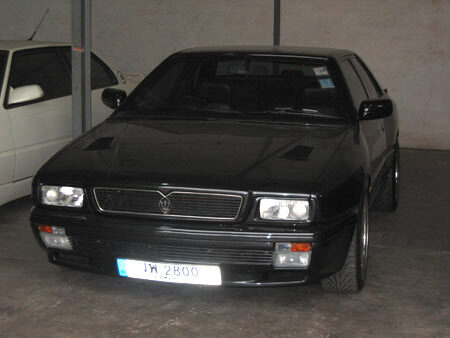 Next was a black Maserati 430, a couple years newer than the 222 but similar in design. 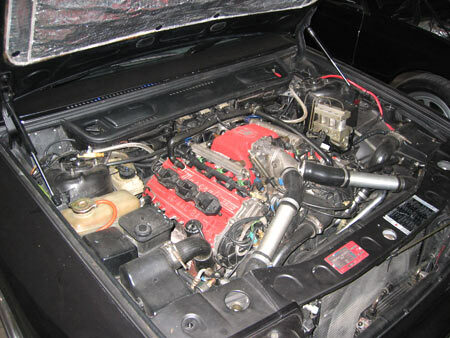 I should mention that all of the biturbo engines were in great shape and quite clean considering their age. All of these cars are driven and enjoyed, none just sit around for show. 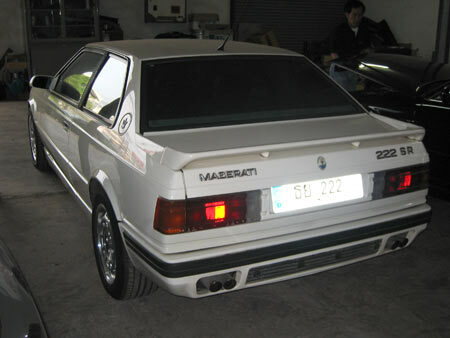 The slightly newer ’96 Maserati Ghibli 2800 had a more muscular look with its flared fenders. I liked the unique cowl spoiler that all of these cars had; apparently it is a unique Maserati trait. 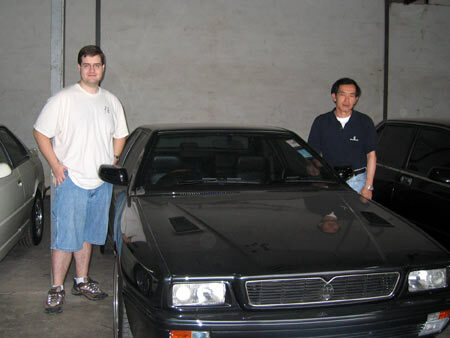 The top dog was the ’98 Maserati Ghibli GT 2800, an especially rare variant that had a very dark, svelte blue/green chameleon paintjob that appeared almost black from a distance. Coupled with the camel interior, it was quite a package. Of course, parts for these cars are rare, so there were plenty of piles of spare parts (especially magnesium alloy wheels) stacked up around the garage — body parts, trim, grilles, seats, even what looked like the chopped half of a junked Maserati coupe languished in the back. Even the oil and coolant for these cars is rare, special-order stuff bearing the Maserati-recommended Selenia brand name. The best thing about Preecha’s entire collection is that every one of these cars is driven, and even better, they’re all ready to drive at any time. No special work is required on any of them before they can be taken out for a spin. He even went so far as to say that he would rather get rid of a car than let it sit for a long time and develop problems that would prevent him from driving it. The man clearly has fun with his collection, which is the way it should be! Definitely some nice cars there. Indeed. Very, very nice. Speaking of cars, I saw a yellow 70’s era T/A for sale. Looked to be mint condition.